What’s a dry slide, it’s the most fun you can have without getting wet and the 18′ Taste the Rainbow slide eliminates the water from the pool section for a fun downhill adventure. The Taste the Rainbow slide from Starwalk of Dallas. Catch your own rainbow with our 18 foot tall 32 foot long dry inflatable slide rental. Our Taste The Rainbow Dry Inflatable Slide will brighten up your day with just one look of this brightly colored slide that can be used for ages 5 and up. While you can’t touch the sky from the top of the slide, you may just be able to get a bit more sun. Sliding down the slippery slide to feel like you are sliding down an actual rainbow! Talk about having fun on a slide, Star Walk of Dallas slide rentals make this inflatable slide rental one of our most popular. This slide is great when the temperature is hot but not too hot. It works best when the temperature is below 90 degrees to keep the slide from getting to hot. This slide is perfect for end of year school events. It is also great for your next birthday party, family reunion or summer camp. Look forward to finding your treasure at the end of the rainbow with this inflatable dry slide! The is a single lane dry slide great for ages 5 and up. Starwalk of Dallas has a variety of waterslides and dry slides for rent to fit all your needs. Our dry slide rentals range from 18 foot slides to 27 foot slides. For the 2-8 year old children, we also carry combo dry bounce house slides. Check these out in our combo bouncers. 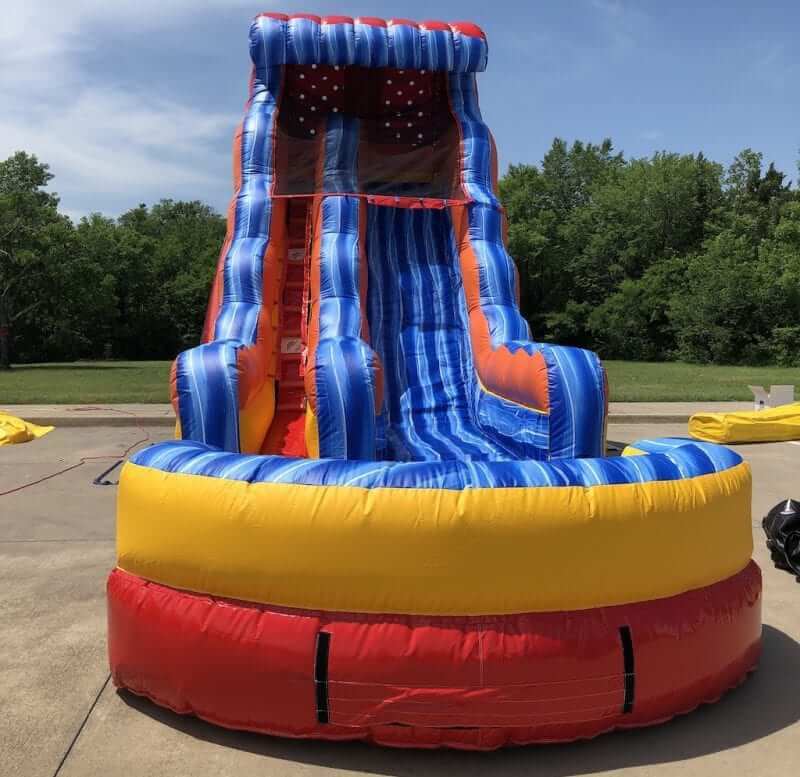 During the hot season, some Starwalk of Dallas dry slides can also be modified to water slides for your next party rental.